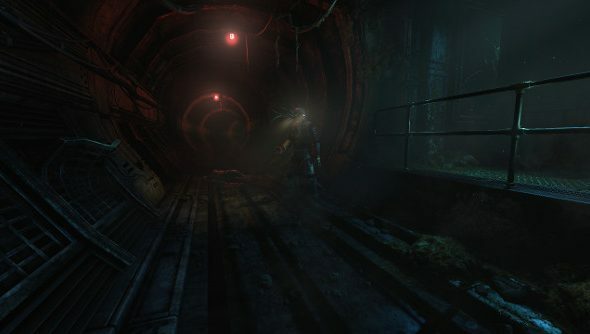 Frictional Games, the sadists behind horror masterpiece Amnesia, have just released a lengthy gameplay video from their upcoming SOMA. It’s a sci-fi horror game set in your typical “remote research facility” where things have gone horribly wrong, as they always must in a distant research facility. It’s a typical premise, but it doesn’t take long for things to take a truly atypical and curious turn in this trailer, which also reveals the game will be released September 22. I’ll admit, I got a little concerned at the start of this gameplay trailer. I think I’ve seen just about every version of creepy, derelict research stations under the sun and at first, there didn’t seem to be much new here. Flickering lights, broken electronics, deep pools of shadow, a general air of rust and decay… been there, done that. WIth Alien: Isolation being so recent, it’s going to take a lot of make those motifs feel new and vibrant. But I kept watching and then I started to feel like this game is breaking from the standard script a little bit. Whatever’s going on this game seems pretty damned weird. Take a look. The concept of all the machines having somehow been imbued with the identities of dead scientists and workers is pretty intriguing and, in true Frictional fashion, disquieting. I also liked the degree to which this looks like a proper immersive sim, with the ability to examine and move different models around, as well as use the machines you find. But then the gameplay demo ends with a berserk robot stalking the main character and attacking and I’m back to thinking… hmmm. Frictional made a game so scary and upsetting that I eventually couldn’t continue playing it. I am sure they know they’re doing. But man did they set themselves a challenge here, stepping into an arena filled with legends of sci-fi horror going back all the way to System Shock.